Chris originally hails from Zimbabwe but grew up in both Germany and Malawi. He graduated from the veterinary faculty of the University of Pretoria in South African 1998 and headed straight to the U.K. were he worked for 5 years. He eventually saw the light and after travelling to various corners of the world came to live in Sydney where he spent 6 years working on the Northern beaches in small animal practice. Chris decided to flee the city and joined Beresford and Carter in January ’10. 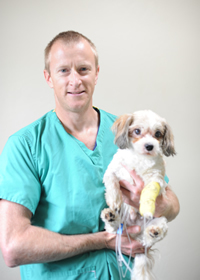 He enjoys the challenges of internal medicine and has developed a keen interest in both soft tissue and orthopedic surgery. When not at work Chris enjoys going to the beach with his wife Susie, his daughters Imogen and Harriet, and dogs Sprocket and Meg. Skittles the cat has to stay at home!